It is imperative that personnel responsible for the operation, and all operators of the Belchfire equipment, read and understand these instructions prior to lighting and use of Belchfire torches. 1. Retain all safety and operational instructions for future reference. 2. Do not leave the torch unattended while in operation. 3. Do not stand or prop the torch on the burner end while in operation. 5. Do not use liquid-feed fuel with any Belchfire torch. 6. Do not use acetylene or oxygen with any Belchfire torch. replacement torch shall be that specified by Belchfire Corporation. 9. Do not exceed withdrawal rates of the fuel being used. capacity to insure vapor withdrawal. 11. When torch is not in use, gas must be turned off at LP-gas supply. Storage and Handling of Liquefied Petroleum Gases, ANSI/NFPA 58.
th 4916 North 125 Street, Butler, WI 53007 U.S.A.
1. Shut off gas to the device. 2. Extinguish any open flame. 3. Check the device for leaks using soapy water. liquids having flammable vapors are stored or used. re-position only when flame is established. It is imperative that personnel responsible for the operation, and all operators of the Belchfire® equipment, read and understand these instructions prior to lighting and use of Belchfire® torches and equipment. All installation and operating shop procedures involving this equipment must comply with OSHA standards for Metal Fabricators, Section 1910 and American National Standards Institute ANSI Z229.1. 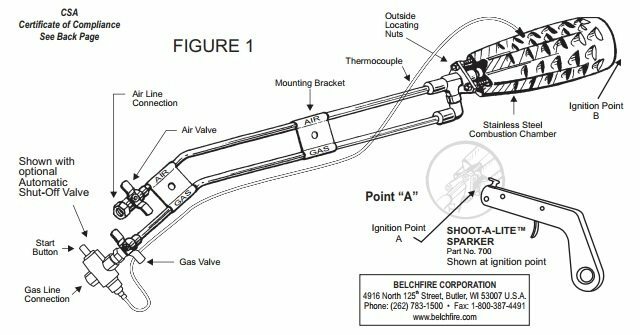 The Belchfire® Gas-Air series torches are designed to operate with natural gas or propane, plus air supplied by shop air compressor systems. WARNING: DO NOT USE ACETYLENE OR OXYGEN WITH THESE OR ANY OTHER BELCHFIRE® TORCHES. Maximum efficiency will be obtained if air and gas lines are at least 5/8” I.D. for the Model E torch and 1/2” I.D. for the Model C and D torches. Minimum line I.D.’s would be 3/8” for the E and 1/4” for the C and D torches. Air and fuel gas lines should be connected to torch fitting as shown on mounting bracket (Figure 1). Gas fittings are 3/8” NPT for Models C and D and 1/2” NPT for Model E.
Gas line pressure can be 1-25 PSI, as long as the withdrawal rates of the fuel used are not exceeded. Gas connections should be made only to a regulator designed to operate with the fuel gas to be used. Air pressure should be 80-120 PSI. 2. With striker positioned at point A, open gas valve slowly until gas flows. Pull trigger on striker. Keep pulling trigger until gas ignites. If no gas ignites immediately, shut off gas by turning clockwise. Check for proper hook-up. If everything checks out, repeat starting procedure steps 1 and 2. 3. Once fuel is ignited, slowly open air valve 1/3 turn counter-clockwise. This will give you a starting flame. The long, bright flame that appears when the torch is lit is fuel gas only, and to be useful, air must be added. This addition of air will cause the flame to start to turn blue and to shorten. As more air is added, the flame will become completely blue. This is a neutral flame and is the indication that the torch is burning all available fuel and operating at maximum efficiency. The addition of more air will cause orange feathers to appear, indicating excess air. ® Belchfire torches have a completely flexible flame which can be adjusted to suit any purpose. The size and type (lazy, long, neutral, oxidizing, etc.) of the flame is controlled by adjusting the valves (air and fuel) clockwise to decrease flame size and shut off, and counter-clockwise to increase flame size. When operating properly, the combustion chamber will be cherry red forward of the ignition point. To insure long, trouble-free service from the torch, the following shut down procedure should be followed to allow the combustion chamber to cool down and prevent heat transfer to other portions of the torch. 1. Turn gas valve clockwise to stop. seconds. Turn valve clockwise to stop. 3. Shut off fuel gas and air supply at the source and disconnect the torch. ® Belchfire torches will eventually require servicing or replacement of parts due to wear from normal use. All maintenance should be performed by authorized Belchfire service personnel. All repairs made by this personnel are fully guaranteed against defective material and workmanship. Repairs made or attempted by anyone other than this personnel cannot be guaranteed. Should any questions arise about the Belchfire torch, feel free to write or call us at any time. In any communications, please give model number of the torch. valves are in OFF position (handles turned all the way clockwise to valve stop). will flow until automatic button is pushed. until a blue flame appears. does not remain ignited, turn gas valve clockwise to stop. clockwise to stop. Contact factory for further instructions. above happens, a restarting procedure must be started to reignite torch. 1. Turn gas valve handle clockwise to valve stop-off. valve handle clockwise to valve stop-off. 3. Shut off gas and air main supply and disconnect the torch. attempted by anyone other than these personnel cannot be guaranteed. at any time. In any communications, please give model number of the torch. new stainless steel combustion chamber. into locating holes in triangle. Replace outside nuts and tighten. the handle. Clockwise tightens; counter-clockwise loosens. Belchfire is proud of the quality of the torches that it sells. 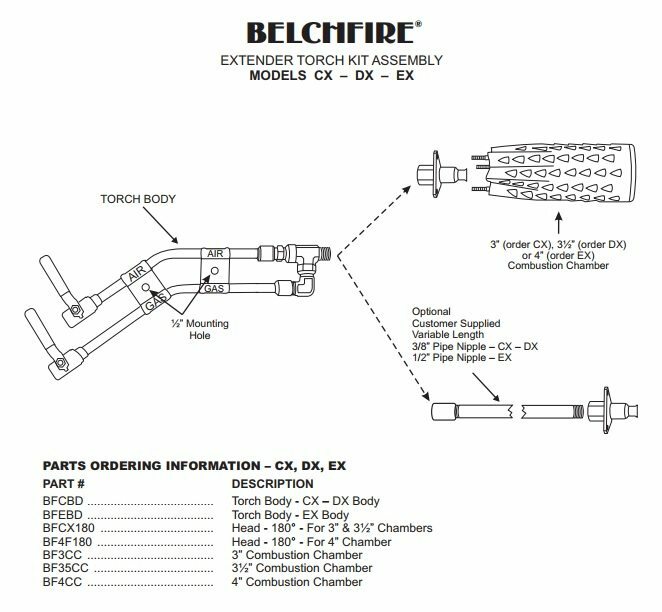 Because of our confidence in our quality, Belchfire agrees to repair or replace any part or parts which examination proves to be defective in workmanship or material. In order to take advantage of this guarantee, the complete torch must be returned, prepaid, to the factory for examination. This guarantee does not include repair or replacement required because of misuse, abuse, or normal wear and tear. Repairs made by other than authorized factory personnel relieve Belchfire Corporation of further liability under this guarantee. THIS GUARANTEE IS MADE EXPRESSLY IN PLACE OF ALL OTHER GUARANTEES OR WARRANTIES, EXPRESS OR IMPLIED, WITH RESPECT TO QUALITY, MERCHANTABILITY, OR FITNESSS FOR A PARTICULAR PURPOSE.